Some books are simply delicious. You know the ones – you savor every word, you don’t want to put it down, you read slowly, and then re-read because you are enjoying it so much it makes you sad to think the book will ever end. This book was so power packed – investigating the true meaning of prayer, and challenging us to think of prayer in a different way. It was also an emotional delight for me, because it was my father’s book, and in it, he underlined and highlighted the passages that had moved him. So, in reading it, I was able to soak in the power of his wisdom, once again, even though he is no longer with us. This book was a gift within a gift. Plus, the book itself is beautiful – a little red book, with a puffy cover, and red borders around each page – it shared wisdom within a delightful package. It provided a process to walk through any period of our lives that we consider to be “Dark Nights of our Soul.” I highly recommend this book for anyone looking for a different perspective on prayer, and the power it can have in our lives. I know I will go back and read and re-read it many times. So…it is time for a new Book Club pick. And, with great joy, I share with you, my book: My 52 Weeks of Worship: Lessons From A Global, Spiritual Journey, by Ekpedeme “Pamay” M. Bassey – me :-). For those of you who have been part of the My52WOW family for some time, you know the story. If not, you can wander around this site and learn. You can read what the genesis of My 52 Weeks of Worship was – when I made a commitment to visit a different place of worship every week for a year, whether that place of worship reflected my religious tradition or not. You can read about why I embarked on this journey – the healing, connection, and remembrance I was looking for. You can read about who I am, and where I visited during the first year of my journey—the sixty-one churches, temples, mosques, synagogues, and gathering places in the United States, Mexico, the United Kingdom, Nigeria and South Africa. You can read about how I chose the places that I visited – and how, sometimes, they chose me. But in the book, I share my stories. Week by week, I take you with me to these different places of worship, tell you what they were like, who I met, and what I learned from them. I share how I felt before, during, and after each service. I share stories from my life – how I came to be the person who would embark on such a journey, and how I was able to learn so much more about who I am and what I am made of as the year progressed. I share my journey of grief to goodness, and I share my global, spiritual, interfaith journey. In this book, I share my heart. So my hope is that this book will bless you as it has blessed me – creating it, writing it, and sharing it. I invite you to let me know what you think of it. I hope reading is as inspiring to you as My 52 Weeks of Worship were for me. 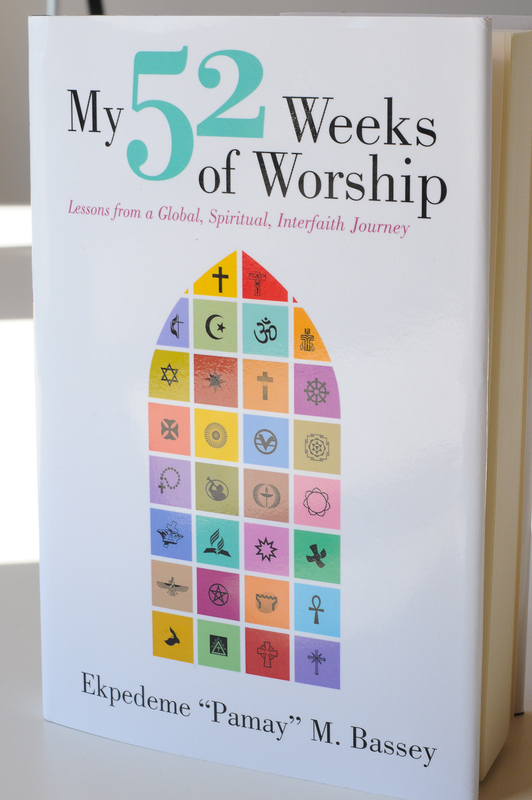 You can purchase My 52 Weeks of Worship: Lessons from a Global, Spiritual, Interfaith Journey on Amazon.com, BarnesandNoble.com, and BalboaPress.com.